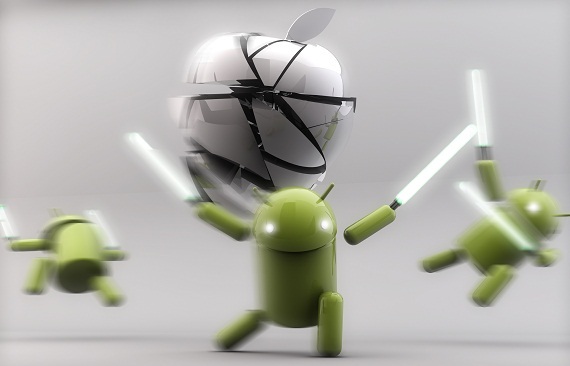 The two powerhouses of the mobile operating system world are without a doubt Android and Apple. They are like two Premier league football teams battling it out for dominance on the smartphone stage. If you were to look just at market share, then it would appear that Android is way out on top with over 80% market share worldwide. But if you look a bit deeper the picture gets a bit more interesting. 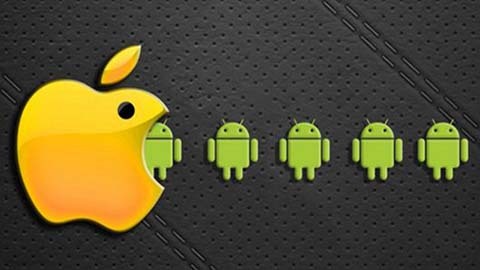 Apple make all of their own phones which means they make all the money from both hardware and iOS, whereas many different manufacturers work with the Android platform and others so the spoils are shared. There is a constant battle for supremacy in mobile technology and in this post I want to look at the pros and cons of each system. In general the popular apps appear on both platforms, but many developers still make for iPhone first and there are still lots more iPhone only apps over Android only ones. There is often better design on iPhone apps than Android and the Apple App store is a much better designed shopping experience. iOS gets lots of updates for the iPhone at regular intervals while Android updates can take months to arrive on all available devices. The updates go on for longer as well with support for phones that are three years old. Support for Android devices finishes much earlier and with different Android devices, different carriers can hold up the updates as each handset has different requirements. iPhones link seamlessly to other Apple devices like Apple TV, iPads and Macs, letting you sync photos and other information between them all. You can take calls on your iPad and Mac or share music between them all. Android devices utilise a lot of third-party applications and services to try and make a similar feature but there are often compatibility issues. AirDrop on Apple devices lets you send files directly to your Mac, even without WiFi. Apple Stores are a great way to fix or replace i-Phones and are readily available with excellent customer support. With Android devices you can often be waiting for days without a phone while you phone support lines and wait for delivery or visit third-party shops for a hope of a fix. The warranty on Apple phones can be extended too, giving far greater peace of mind. There is a much wider range of iPhones now than there have ever been with the iPhone 6s Plus, iPhone 6s and iPhone SE as well as older phones -- but there are still only three screen sizes and two basic designs available. Android offers much more choice with many different manufactures providing a plethora of designs with waterproof phones, lots of screen sizes, different colours, materials and other cool features. You can choose from waterproof handsets like the Galaxy S7 or S7 Edge more modular phones like the LG G5. There are also much bigger screens like the Note 5 with a built-in stylus. Some Android phones also come with wireless charging or replaceable batteries, which you can’t get without adding a case to the iPhone. Android handsets are more easily customised than the iPhone. You can choose a launcher that drastically changes the design of your home screen. You can change the colour of your theme and change many other things about the look. The only option if you want to do the same with iPhone is to jailbreak it which runs into many other problems when it comes to updating your phone. A lot of Android phones offer Micro SD card support - which allows you to store more photos, videos and apps at a low cost. You can increase storage up to 128GB on some phones at a fraction of the cost of the 128GB iPhone. With the lower 16GB and 32GB iPhone models you are stuck with that amount of storage which is often not enough for a lot of users. In addition to expanding available storage, Android phones also offer the ability to clear data caches on Apps. Apps that download photos, videos and other data to your phone like Vine or Instagram often keep additional data in a cache that doesn’t necessarily get cleared when you remove the original data. On Android you can sometimes clear the app cache to remove the ghost data whereas on Apple phones the only way is to remove the app and then reinstall it.